Many players develop a phobia about straight-in shots, but the added level of difficulty is all in their heads. They are tougher, in a sense, because players' mechanics break down when they believe the shot is too tough. Let's look at the shot for different skill levels. First, all players should be aware that their grips tend to tighten when they're unsure of a shot, making the cue sway to the left or right on the stroke. So, check in with your grip beforehand. With a straight-in shot, you basically have three options: a stop stroke, follow or draw. A stop shot is your safest bet (see Diagram 1), and beginning players should practice short and long straight-in stop shots as a matter of course. Stay away from follow shots, unless you have great speed control. Advanced players miss straight-in shots because they get caught up in getting shape for their next shot. Some use left or right English (even just to pocket the ball), but the off-center hit increases the chances of deflection. Try a simple center-line draw shot, bringing the cue ball straight back up-table for better position (Diagram 2). You could try some side English on the draw shot, changing the angle of the cue ball's path when it hits a cushion (orange lines and text). Follow shots likely will scratch. 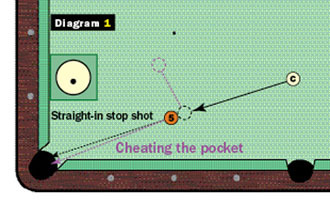 Elite players might cheat the pocket - slightly cutting the object ball so it will drop in the right or left side of the pocket, sending the cue ball the opposite way (Diagram 1, purple lines and text). Side English is an option, but you'll very rarely see me use it. It just raises the degree of difficulty, and I'm already getting an angle by cheating the pocket.